A traditional thatch house in the countryside between Kalaw and Inle Lake. Kalaw is a quiet mountain town in Central Myanmar. 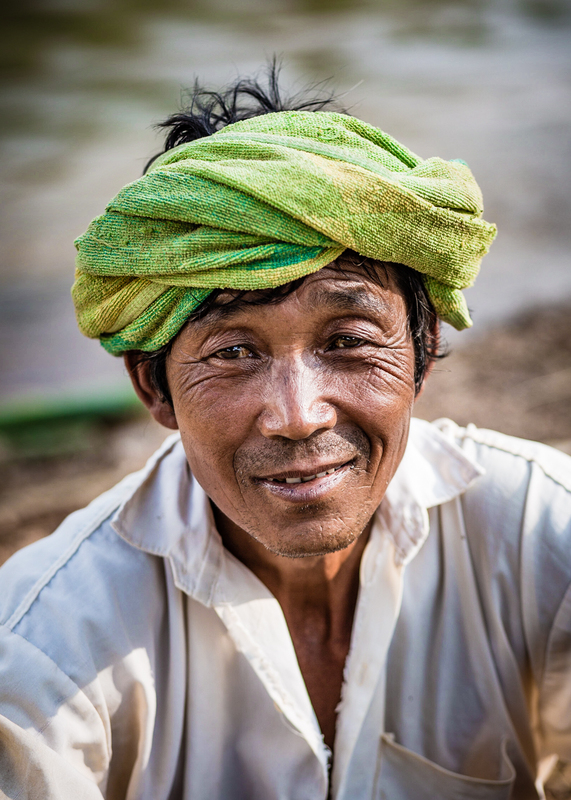 Originally founded by the British as a hill station to escape the heat of the surrounding plains, Kalaw is still home to notable communities of Sikhs, Nepalis, and Indians, having ensconced themselves in the area since their ancestors came to build roads and railroads for the Brits. Most travelers only spend a day or less in the understated town as it primarily serves as a jumping off point for trekking trips to Inle Lake, a marshland and wildlife sanctuary, and one of Myanmar’s principal tourist destinations. Although I would have liked to hang around Kalaw longer to enjoy the cool weather, with my visa clock ticking, I went with the program and enlisted for a three-day trek to Inle. Elliott (Whales) shares a laugh with a resident of Kyaut Su, a village a day's walk from Kalaw. Although we didn't speak the same language, we managed to make joke and share some laughs with the locals. I’m usually weary of organized group activities with other foreigners because I feel that it makes it harder to interact with locals. While the three days of walking were mostly spent gazing at the scenery or talking with other tourists in the group, the evenings gave way to really interesting cultural experiences, as we stayed in a village homestay the first night and a monastery the second. Thus, the trip turned out to be a good balance between having fun with fellow backpackers and experiencing the local culture. Sometimes these two aspects of the trip merged, for instance when we were invited into a villager’s house to share a bottle of rice wine or playing soccer with the local kids. The trekking group consisted of around 8 travelers, everyone from Europe or North America, except for one Colombian guy who is now living Amsterdam. Our guide, Aakash, was a twenty-something of Nepali and Tibetan descendent—who, despite growing up in a Hindu household, has become enamored by Buddhist teachings and is contemplating becoming a full-fledged Buddhist monk. I can’t describe the trek as a highlight—because virtually every single day I’ve spent in Myanmar has been absolutely unforgettable—so I will just drop a shoutout to the British guy who I met on the bus on the way to Inle who persuaded me to get off at Kalaw instead of going all the way to Inle, as I originally planned. Thanks British guy! Shwe Oo Min Paya, Myin Ma Hti Cave, suppossedly built more than 2000 years ago, features thousands of Buddha statuettes. Aakash, our guide, explaining to us how the locals use bamboo. A ginger harvest in Kyaut Su village, where we slept our first night. Kyaut Su village is about a day's walk from Kalaw. Sweet kid who convinced me to play soccer with him with a deflated ball. We drank rice wine with this flamboyant villager in Kyaut Su. A women preparing dinner for her family. The villagers of Kyaut Su live in thatch houses. Members of the trekking group. It appeared as if the women did most of the agricultural labor. They seemed to be having a good time though, chatting to one another as they worked. Betel leaves for sale in the bazaar at Nan Tine Village, Myanmar. Petrol for sale in re-used plastic water bottles. Very common in Indochina. A boy preparing traditional baskets made from bamboo. Water bufallo taking a dip with some trekkers from a different group. A woman wearing a traditional headscarf. Most of the villagers in the area are subsistence farmer famers. Cows are used for labor in lieu of meat or milk. The Burmese apply Thanaka, a paste made from bark, to protect against the sun. Woman plowing in the outskirts of Htee Their village. 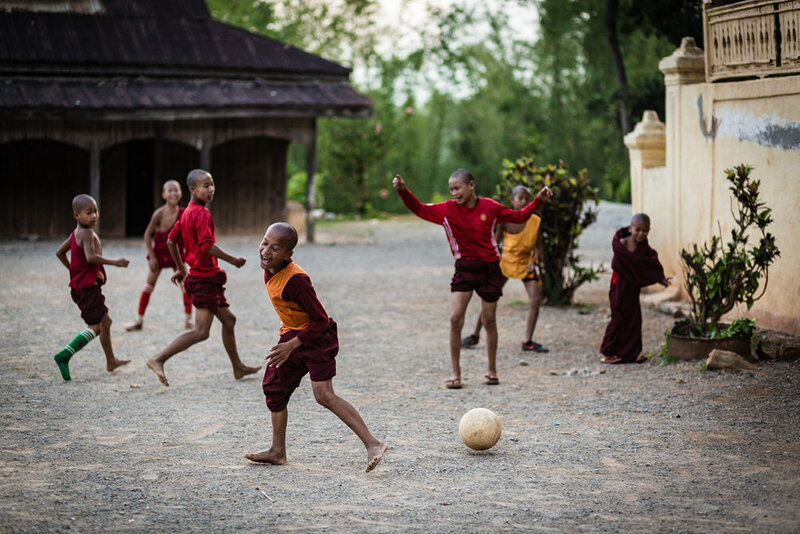 Young monks playing soccer at the Htee Their village monastery, where we spent our last night. During their morning free time, the monks horsed around, whacking one another with their their robes tied into bundles or using their robes to drag each other around. The Htee Their village monastery. After we let the monastery, the monks passed on on their way somewhere. Women carrying transporting of hay near Htee Their village. A fisherman on Inle Lake. The lake and area around it is a national reserve containing a number of endemic species. The last leg of the trip was a scenic boat ride across Inle lake to the town of Nyaungshwe, the tourist nexus for Inle.